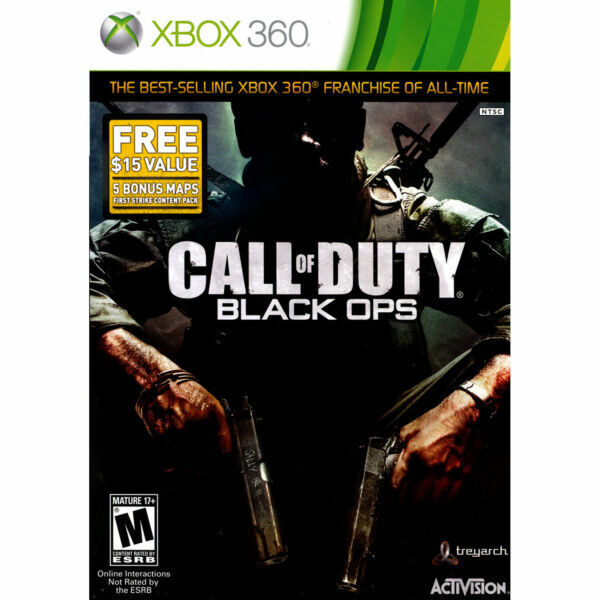 eBay Powered by Frooition About us Shipping Returns Contact us Our Reviews Promotions Call of Duty: Black Ops Shop Categories Helpful Links Add to Favorite Sellers Sign up to Newsletter View Feedback Contact Seller Visit seller's eBay Shop About Seller Page Call of Duty: Black Ops Item Description Product Description: Call of Duty: Black Ops is a first-person shooter with stealth and tactical play aspect that puts players in the role of a shadow soldier fighting in a variety of historically representative fictional Black Ops missions of the Cold War era. Created with the input of actual Black Ops soldiers from the time, the game mixes traditional Call of Duty tactical shooter gameplay with new gameplay options designed to expand the players' experience. Putting Out the Hotspots of the Cold War The follow-up to 2009's blockbuster Call of Duty: Modern Warfare 2, Call of Duty: Black Ops breaks new ground in the Call of Duty series and the video game industry at large by delving into the not-so cold conflicts of the Cold War. Inspired by the experiences of real Black Ops soldiers of the era, the missions of Call of Duty: Black Ops take the player to a wide variety of settings, ranging from snowbound mountain strongholds in historical Soviet held territories, to the jungles and urban settings of Vietnam War era South East Asia. Throughout all, care has been taken to maintain the traditional essence of Call of Duty style combat, while also introducing new types of player action that adds to the gameplay experience. Additional features include co-op, versus and team-based multiplayer options, new vehicles like the SR-71 Blackbird and lethal new weapons such as explosive-tipped crossbows. Features: An Incredibly Deep Multiplayer Experience: Expanding on the series' ultimate multiplayer experience, Call of Duty: Black Ops takes competitive play to new heights. Expect the fast-paced, action-packed combat you love with more features than ever before. An Epic Single-Plater Campaign: The hallmark intensity of Call of Duty returns with an epic single-player campaign that takes players deep behind enemy lines as an elite Black Ops soldier engaging in covert warfare, classified operations, and explosive conflicts across the globe. Zombies Return: The fan favorite co-op mode made famous in Call of Duty: World at War is back as you and up to 3 friends use a multitude of weapons to fend off endless waves of blood-thirsty Zombies. Fight to survive in one of the most thrilling and critically-acclaimed co-op experiences in gaming.Game Variation:Actual product received could be slightly different than what picture shows. To clarify the main photo may show the standard edition but you could actually receive the Greatest Hits, Platinum or a store specific version e.g. Walmart exclusive or Best Buy exclusive. Game Manuals Certain publishers have opted not to include physical manuals. If you do not find a manual please visit the publishers website for a digital version.Backwards Compatibility:This game is backwards compatible, meaning the Xbox 360 version will be playable on the Xbox One. More information and a complete list of games can be found on the xbox website. You May Also Like More Items!View more great items Video Games Game Consoles Accessories Toys 2 Life Last Chance About us Shipping Returns Contact us Our Reviews Powered by Frooition Frooition | No-js Template | eBay design, eBay store design, eBay shop design, eBay template design, eBay listing design (ver:froo_no_js) This listing is currently undergoing maintenance, we apologise for any inconvenience caused.